This tart, easy-to-grow perennial is great for pies and jams, especially when coupled with strawberries. It comes to life when temperatures rise into the 40s F, making it one of the earliest spring crops. Yields best in full sun. Well-drained, deep, fertile soil, high in organic matter, pH 5.5 to 6.5. Yields best with plentiful, consistent moisture. Needs extended temperatures below 40 F.
Flower stalks may reach 5 feet tall. Remove flower stalks to increase production. frost - Hard freezes in late spring can damage leaf stems. Propagate by division or separation - All cultivars are hybrids and do not breed true from seed. Plant dormant crowns, as soon as you can work the soil in spring. You can cut crowns into pieces, but make sure each has at least one strong bud. Plant 1 to 3 inches deep and 2 to 3 feet apart. Mulch to suppress weeds and retain moisture. Plants require little or no fertilizer. Growth slows and flower stalks form when temperatures warm in summer. In cool regions, growth may continue if you have adequate moisture and remove flower stalks. In warmer areas, growth may resume in fall - sometimes enough for a light harvest. Horseradish makes a good companion crop, as both are long-lived perennials. Renovate beds when plants become crowded and leaf stems small (usually in 5 to 15 years) by dividing crowns and replanting in fall or spring. Rhubarb curculio - Handpick adults. Remove broadleaved weeds from area. Fungal leaf spot - Avoid wetting foliage if possible. Water early in the day so aboveground plant parts will dry as quickly as possible. Avoid crowding plants. Space apart to allow air circulation. Eliminate weeds around plants and garden area to improve air circulation. Practice plant sanitation. When plants are not wet, carefully remove and destroy or discard affected plant parts. In autumn, rake and dispose of all fallen or diseased leaves and stalks. Phytophtora crown rot - Can be a problem in poorly drained soils. 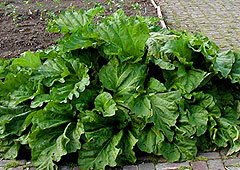 Browse rhubarb varieties at our Vegetable Varieties for Gardeners website. Look for different stem colors -- pink, red or green. 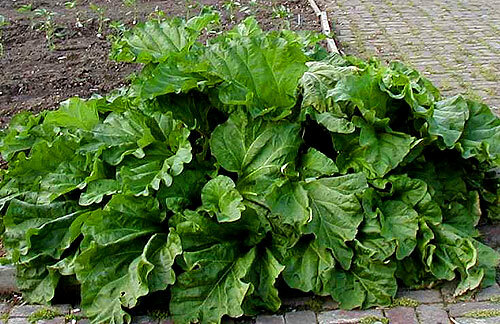 Ornamental varieties are different Rheum species.